SCOTTSDALE, AZ--(Marketwired - Nov 6, 2013) - TASER (NASDAQ: TASR) today announced multiple orders of its next generation TASER® Smart Weapons. These orders were received and are expected to ship in the fourth quarter 2013. 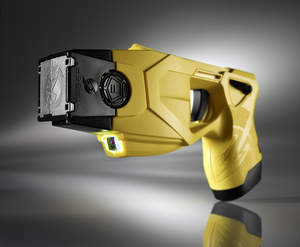 TASER protects life: TASER Conducted Electrical Weapons (CEWs) have saved more than 115,000 lives from potential death or serious injury. TASER protects truth: We enable greater transparency with the industry-leading TASER CAM and AXON flex on-officer video systems. Together with our customers, we are defining the future of smart policing by connecting intelligent devices and sensors with the first secure cloud-based digital evidence management solution for law enforcement: EVIDENCE.com.